The author is not trying to reinvent the wheel; she does want to help you make the most of your child’s free time. 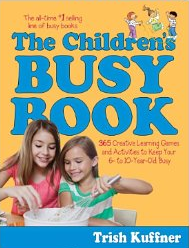 Contents of this book are designed to stimulate creativity, social skills, imagination and thinking skills. They can be used after school, during the summer, or on a weekend. The ages six to ten are recommended but not arbitrary as younger children as well as adults might also enjoy them. They are not gender specific; the categories are generalized with much overlapping.